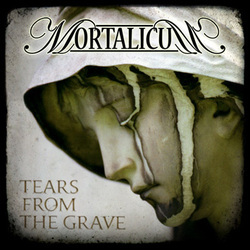 Album number three for Swedish doomsters Mortalicum and it is chock full of gloomy riffing and somber vocals. The band is a bit more than just a doom band as they do have some boogie style hard rock mixed in with the doom and gloom at certain points to give them a bit of a different feel. Now I am a huge fan of doom metal and a huge fan of hard rock and usually when they mix I can really get into it, but unfortunately on this particular album there are a lot of points when it just seemed a bit mellow and sleepy. More of a lethargic vibe going on so it seems the atmosphere was a bit off overall. Granted it is not exactly supposed to be a happy affair and I didn't expect it to be, but in their effort to establish a certain feel for the album I think they may have taken too much away from the music itself. To compound this, the vocals are too off in the mix for my liking as well. It seems like he was standing too far from the microphone to get a good sound as the voice seems to be coming from a distance and is drowned out by the rest of the music on here. I am pretty big on the vocals of a CD so this was another detraction for me. Not everything is "doom and gloom" here however as there are definitely some fine morsels on this release that I will return to on a regular basis such as The Endless Sacrifice, I Am Sin, Spirits Of The Dead and I Dream Of Dying in particular. These are good playlist tracks, though I don't think I will find myself venturing to hear the whole album again anytime soon. Even after a few listens I just couldn't get into the rest of it.